Use the storage containers for lunch, storing leftovers, to conveniently transport potluck items and even use them to organize various craft or tools at home! Each set comes with 4 different sized containers with corresponding lids. 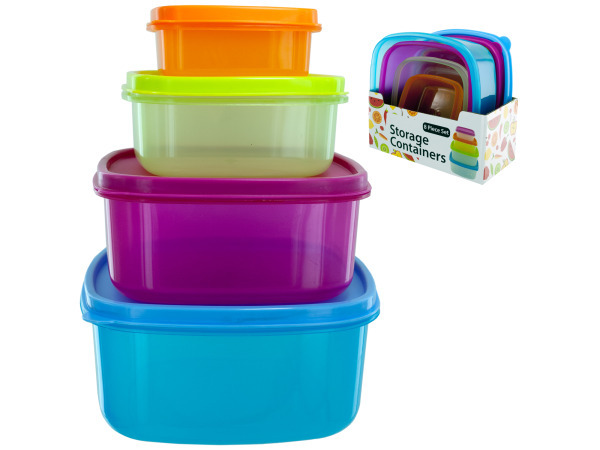 Containers are made of sturdy plastic and are each different colors making them great for color coding organization. Set is packaged together with shrink wrap and placed inside an open box. Container sizes are 47 oz., 33 oz., 16 oz. and 7 oz.